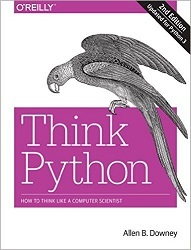 Think Python is an introduction to Python programming for students with no programming experience. It starts with the most basic concepts of programming, and is carefully designed to define all terms when they are first used and to develop each new concept in a logical progression. Larger pieces, like recursion and object-oriented programming are divided into a sequence of smaller steps and introduced over the course of several chapters. If you are using Python 2, you might want to use The First Edition. We've upgraded to Python 3: All examples in the book are now Python 3, and the supporting code has been updated to run in both Python 2 and 3. We've removed the roadblocks: Based on reader feedback, we know where people had problems, so we've fixed or removed the pain points. Python in the browser: For beginners, one of the challenges of getting started is installing Python. For readers who don't want to install Python right away, we provide instructions for running Python in a browser using PythonAnywhere, a free online programming environment. More Python goodies: We've added a chapter to cover some powerful Python features that didn't make it into the first edition, including list comprehensions and additional data structures. Allen B. Downey is an American computer scientist, Professor of Computer Science at the Franklin W. Olin College of Engineering and writer of free textbooks. He has taught computer science at Wellesley College, Colby College and U.C. Berkeley. He has a Ph.D. in Computer Science from U.C. Berkeley and Master's and Bachelor's degrees from MIT.